Barcelona probably won’t win anything significant this season. They remain underdogs for the league title, were ousted from the Champions League by Juventus after surviving the Paris Saint-Germain tie by the skin of their teeth, and can only really count on a Copa del Rey consolation prize to cap off what has been an erratic, disappointing season. And yet in spite of this lack of concrete success, the internal turmoil that has come with it, and the creeping feeling that the club has wasted another of the limited remaining prime years of their three superstar forwards, Barcelona clawed and scraped and fought their way into two iconic victories this year, along the way creating a few individual moments as unforgettable as any that have come before. No single image from the long career of the greatest soccer player the world has ever seen—and maybe not even any other image from Barcelona’s entire storied history—is as indelible as that of Lionel Messi slipping off his jersey, turning it around, and brandishing the name on the back of it in front of the tens of thousands of Real Madrid fans in the stadium and the millions more watching on TV after he scored his last-minute, victory-sealing, soul-crushing, title race-opening goal in yesterday’s Clásico. Mere seconds before the giddy hearts of all those Madrid fans and players were set to erupt in jubilation on the cusp of landing what would’ve been a crippling blow to Barça’s La Liga hopes, Messi reached into their chests, gripped their franticly beating hearts, tore the organs out, and stood there before his victims, hoisting his bloody trophies to the sky. It was unbelievable, savage, glorious. Yesterday’s Clásico was one of the best editions of the rivalry in recent memory, in part because it was kind of bad. There was little regard for boring yet important things like game planning, structural solidity, tactical discipline, or managerial adjustments. It was a match of pure emotion, of two teams focused only on bombarding the opponents’ goal, and because of that it was wide open from beginning to end. This was about as far away from the tight tactical battles of the Mourinho-Guardiola era as is possible, which made for an out-of-control, exceptionally entertaining match. Oddly, this Clásico felt so big because the stakes were in some ways so small. Because the title would’ve remained entirely in Madrid’s control no matter the outcome, the ancillary concerns and meanings of the game fell away. The motivation wasn’t so much about Barça trying to get back into the title race or Real trying to end it or anything like that. Instead, the match was important for its own sake, as a self-contained entity. That’s the only cognizable explanation for why Barça didn’t just play keep away for the final 15 minutes of the match when up a goal and a man, and why Real kept pushing numbers forward in attack even after they’d already equalized with 10 men. Barça wanted to embarrass Real, to run up the score; Real in turn wanted not just to come from behind and steal a draw—a result that would’ve all but ended the title race—but to press on and win the damn thing to humiliate their eternal rivals. There was a primacy in the desire to win that game on that day which gave the match its unique and electric energy. That too made Messi’s dominating performance and the storybook climax so sweet, so memorable. Again, Barcelona still have lots of work to do if they’re to end the season as La Liga champions. They’ll probably need to win all their remaining five league matches—a streak of results they could only pull off by demonstrating a consistency they haven’t managed all season—and even then would still need Real to slip up by losing once or drawing twice. The more likely scenario is that both Real and Barça drop points in a match or two during the closing month of the season and Real finish the campaign atop the league table. From that vantage point, the result of this match might not wind up meaning that much. But just because Barcelona probably won’t win the league off the back of this Clásico victory, and just because they wound up losing in the next round of the Champions League after the PSG miracle, doesn’t mean that these games themselves and the moments that comprised them don’t matter. 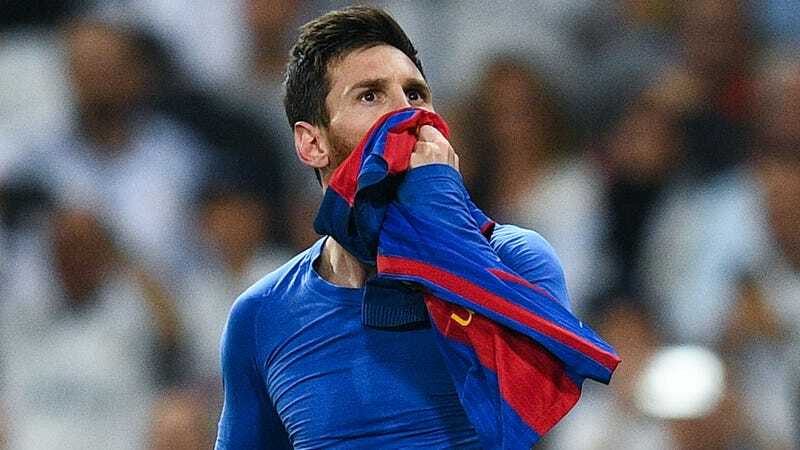 Barcelona fans will never forget Messi killing Madrid in Madrid with that last-gasp goal, nor that picture of him lifting his jersey before the stunned Madridistas, nor Sergi Roberto’s shocking stoppage time volley that completed the PSG comeback, nor Messi leaping up on the ledge of the stands to celebrate Roberto’s goal with Barça fans. Sports, like life, are best measured in moments like this, crystalized images from certain important times that become stained in your memory like spilled ink. Barcelona’s 2016-17 season might not be notable for the number and impressiveness of the trophies the team ends up winning, but it is already rich in moments permanently impressed on the brains of those who saw it. Isn’t that what all this is about anyway?